The book in the photo above is the History of the families of Larcom, Hollis, and McKinley by Montagu Burrows, R.N., M.A., published in 1883 in Oxford, England. 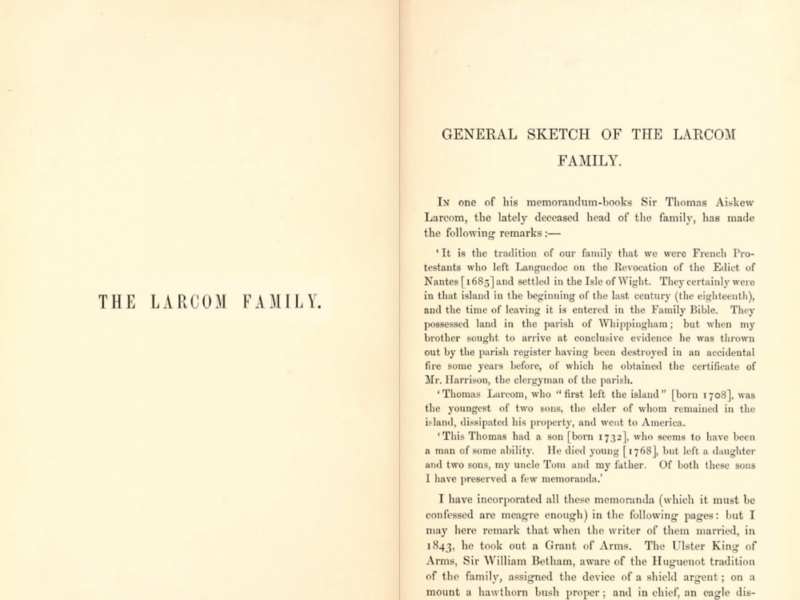 It is as the section of the book is titled, a “General Sketch of the Larcom Family” which recounts the tradition that the family moved from France to England and some henceforth to America. Most of the early history written in this book came from a memorandum written by Sir Thomas Aiskew Larcom (1801-1879), who was under-secretary to the Lord-Lieutenant in Ireland. It is mentioned here that after the Revocation of the Edict of Nantes in 1685, our family left the French province of Langeudoc and settled in the Isle of Wight. 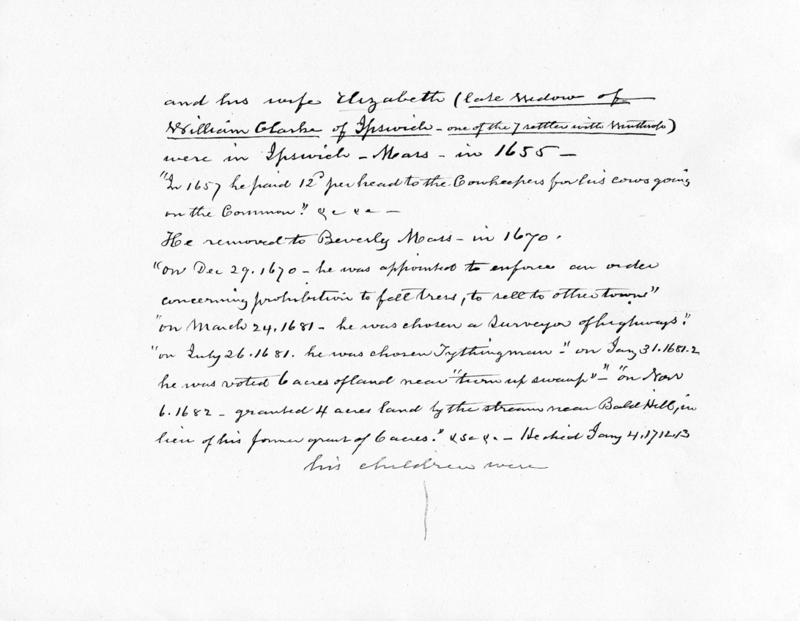 They possessed land in the town of Whippingham; however, according to his memorandum, all of the records in the parish register were destroyed by accidental fire. This means, it is difficult to know who lived there exactly because all records such as births, deaths, marriages, land ownership, etc. were destroyed. 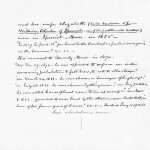 There is, however, some family history that was recorded for Sir Thomas Aiskew Larcom’s line. Thomas Larcom who first ‘left the island’ [born 1708] was the youngest of two sons, the elder of whom remained in the island, dissipated his property and went to America. During the persecutions consequent of the Revocation of the Edict of Nantes, or during the terrible trials of Protestants preceding the Revocation, a French or Piedmontese family of La Combe fled from France to England, and settled in the island [? if this means the Isle of Wight, as the word ‘removed’ which follows implies a settlement in some previous place in England]. One of the brothers of this family, after some years, removed to a county between the Channel and the vicinity of Bristol to America, settled in Hartford, Connecticut, and died there at a great age, 102 years. So here we have a Larcom who left the Isle of Wight for America. According to Sir Thomas Aiskew Larcom, this account of the Larcom family in America fits in with precision to what was gathered with his family Bible. This is an excellent account of the Larcom American immigrant for the families who have descended from the Connecticut line. 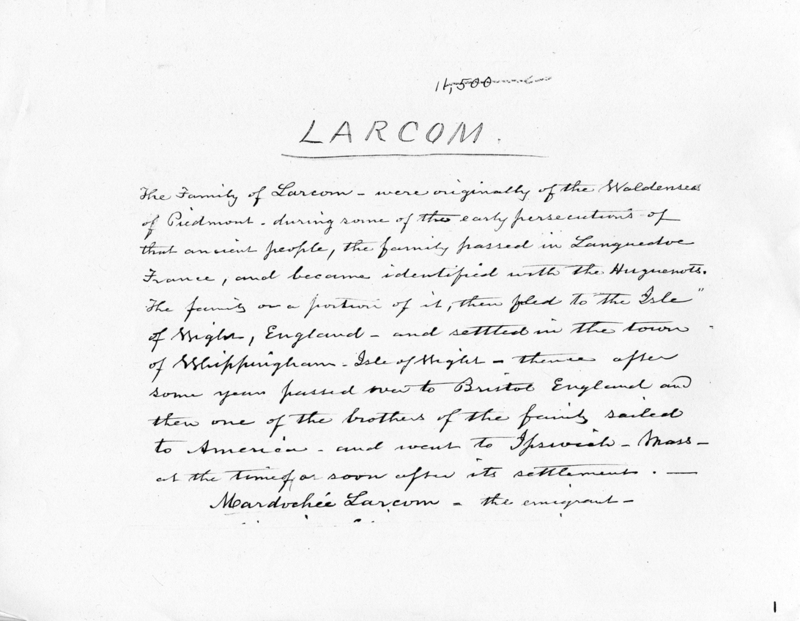 However, it is not so clear about the Larcom American immigrant for the Massachusetts line. This is the branch of Larcoms that I have descended from. The story that I was told as a child, and even written in Mary Larcom Dow’s book, Old Days at Beverly Farms, is said that our emigrant ancestor came to America aboard the ship Hercules in the 1630’s. As you can see a William Latcome is listed on the passenger list above. However, I have recently been in conversation with a Larcom cousin who brought to my attention that our presumed emigrant ancestor William Latcome may not have been aboard the ship as it sailed for America. I have always assumed that he came to America, but there were just no records available for his emigration. It makes some sense now that since there isn’t even a death record for him, he must not have come aboard the ship Hercules. This means we have much more research to do. 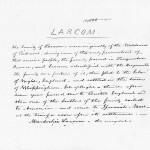 Going back to the facts, we should probably start with Mordecai Larcom, Sr. (1629-1712), my 8th great-grandfather, who happens to be the first person on my family tree. Mordicha Larkcum being complained of by his Mr Rich: Jacob for neglecting his service, by consent of master & servant it was agreed before the court yt ye sd Mordicha Larkcum shall pay unto his Mr 25s. I believe whole-heartedly that the Connecticut line & Massachusetts line of Larcoms are related, somewhere down the line simply because our surname is so unique. So who is our common ancestor? By suggestion of a dear cousin, I think comparing an American Larcom paternal line DNA to a European Larcom line might be in order. I have recently received results of my father’s DNA and his paternal line halpogroup is E1b1b1c1a. Although, I am now learning that I will need a specific marker (STR markers) that may help give a more recent variation of the DNA which might help decide how close a relative may be. We will have to undergo further testing to get this information – so back to the drawing board! If you are a Larcom descendant and would like to help me piece this puzzle together, please respond below in the comments section or send me a message. I would love to explore this further, and I plan to update this page if and when I find or receive any further information. Hi, Jen, I am also a Larcom, descended from Andrew, brother of Uncle David in your family tree, and son of Jonathan who died at sea as a privateer. You are, I think, the descendent of David, Andrew’s older brother. 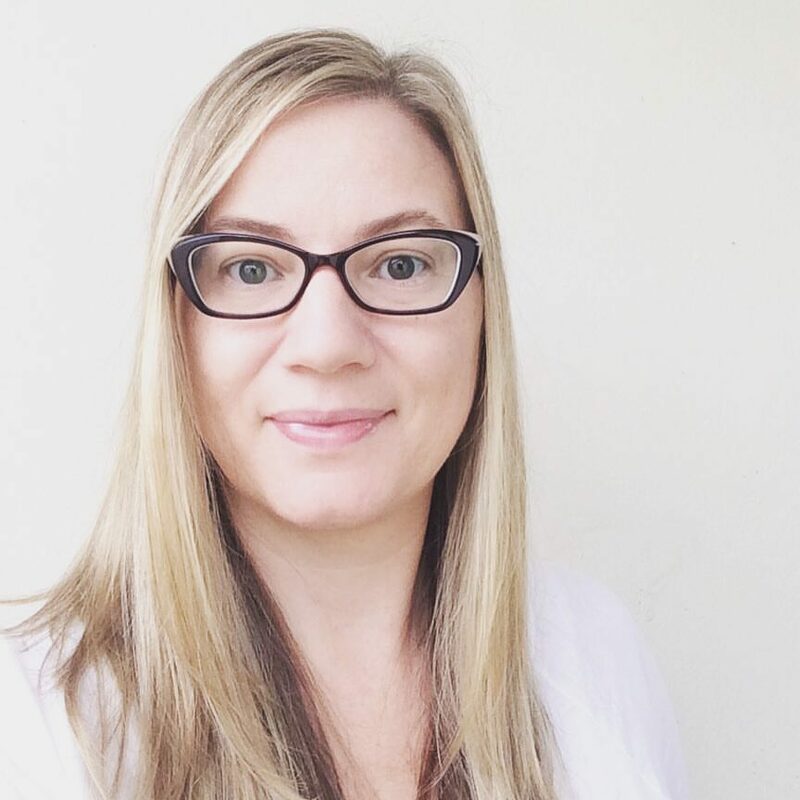 My daughter set me a task of telling some of the stories of my grandparents, one thing led to another and so now I have a rather long family tree on ancestry.com. I don’t think I can be much help finding out the Larcom who first settled in Cape Anne but I would like to know if you eventually discover who that was.